Yesterday was a perfect day. Some days are like that (actually a lot of them are), so it’s kind of hard to tell about them for fear of sounding like we’re wiggling our fingers in our ears, sticking out our tongues, and saying nanner nanner! We just love sharing about our adventures and lately it seems like those adventures are pretty damn awesome! 🙂 So with a disclaimer that our day was full of sunshine and smiles, whales and wahoos, – here’s a short description of an otro dia en paraiso. Coffee was heated, logbook updated, flying objects tied down, and it was time to weigh anchor. The sun started peeking through the heavy cloud cover as we pulled out of Chacala, heading south. A fishing boat was heading into the bay south of us so we motored along next to it for a bit. The boat was well loved and was covered in pelicans – every line and cable had a scavenger waiting for brekkie! They soon passed behind us and then it was time to hoist the sails. With the winds forecast to be 8-10 from the north, we weren’t surprised a bit to have 8 knots of wind out of the southeast…ha! Luckily it was a perfect wind for a beam reach that allowed us to sail our rhumb line. 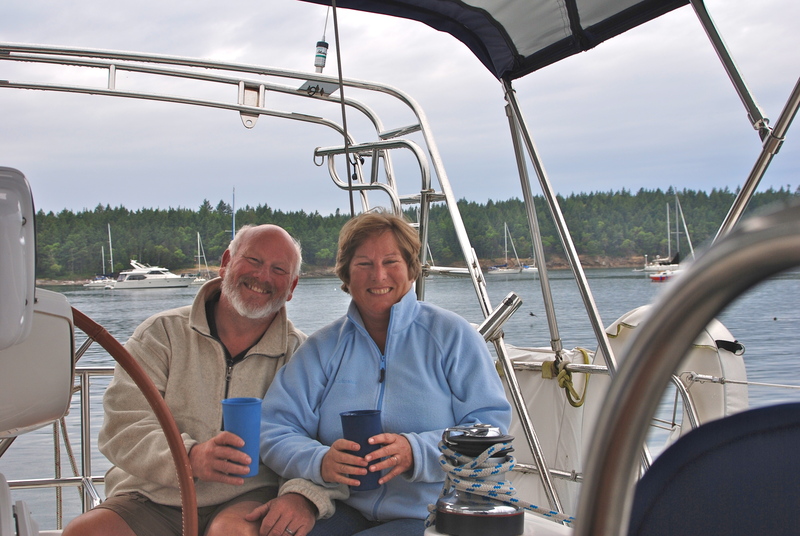 We set the mainsail and genoa and turned off the engine. The sound of Happy Dance riding the swells and the gurgle of the wake as we sail along at 5 knots in a light breeze is glorious. The sun was up now and we were leaving the clouds behind. Our destination was Punta de Mita, the point guarding the north end of Banderes Bay. A whale breaching…did you see it?? We started seeing humpback whales off in the distance, some close some far, but all very active! We have come to learn that December to March is when the humpbacks come into this area, and specifically in Banderes Bay, to give birth each year! When we were in Maui two years ago, we had the best time going out in rubber rafts every day with Ron and Cindy, to see the whales. Now we are getting to do it again – bueno!!! We did see one group with a baby in it, though it was too far for any photos. I can share lots of photos of water though…where the whales were! While we were sailing along, singing a song, we had the fishing line out. It didn’t take long until…fish on! The rubber line was stretched to the max, and we could see something jumping at the end of the line. Marty hauls in the line hand over hand while I try and coil it to keep it from tangling. It’s important that Marty keep tension on the line or else our fish will probably get loose (and yes we know this from experience!). As the fish got closer we thought it was just another skipjack tuna, which we’ve started releasing since they aren’t our favorite. But then when it got close, we realized it was something new…and big…and had rather sharp looking teeth! Marty brought it into the cockpit, and we both jumped up on the seats like a couple of school kids screaming at a mouse, rather than let Mr. Fish thrash his big giant teeth around our ankles! At this point we had no idea what we’d caught, and thought it might be a barracuda. We tried to subdue the beast while I grabbed a knife and Marty held onto the line. Not knowing what we had, I wasn’t sure if or where to bleed the guy, so I just treated him like a tuna and it seemed to work. Blood everywhere, ugh! I went to get the book, and Marty got out the buckets. Still alive, we’re afraid, very afraid…ha! I finally found a photo of our dead friend, and it was a Wahoo! Yippee, white fish on the bar-b tonight! Mr. wahoo was pretty big; I guess we should start measuring or something, but we’re always so amazed that we forget. It was about 3 feet long (Marty says 4..ha) and it was heavy! The fishing book said to make steaks out of it, but we like filets better so I filleted it. There were four large fillets, that would each make 4 servings easily. YUM! After we had the cockpit all clean and the fish in baggies, the wind started slowing, so we rolled up the genoa and cranked up the engine. We leave the mainsail up a lot when we’re motoring because it usually gives us a little extra push and it also helps to smooth out the ride when we’re in swells that are messy. All was easy today though, as the winds have been light for over a week and there isn’t much of a swell at all. Now we just sat back and let Otto (the auto-pilot) drive, while we watched for whales. We saw about 6 groups of them around us and a couple times we had to throttle back to neutral to let them pass in front of us. No matter how many times we see these gentle giants, it’s always incredible. When we passed by Punta de Mita to enter the anchorage we had a pair dive right under the boat. Too cool. The anchorage at Punta Mita is more populated than our favorites so far, Matanchen or Chacala, but it’s still lovely. After getting everything set to stay at anchor we jumped in for a swim. I love love love being able to swim whenever I want to. The water is in the high 70’s, and we are anchored in about 18’ near a rocky beach where we can hear the breakers. The point has some pretty big surf rolling in, so we’ll probably take a ride out there to see the surfers. Happy hour was spent watching the sunset from the cockpit and listening to music (yes, a bit more Norah). Dinner was simple; bar-b-qued wahoo with some garlic butter and lime, and the last of our fresh romaine and tomatillos in a salad. There was a nearly full moon out, so we had plenty of light to eat our dinner al fresco, and listen to the waves. We sat out for quite awhile, just being quiet and soaking it all in, watching the moon and stars sparkle on the water, listening to fish jumping and waves crashing, and sharing lots of sighs, celebrating the end of another perfect day. In case you weren’t sure – your sailing jargon lesson for the day! *Reach: In a beam reach, the boat is sailing at a perpendicular angle to the wind. The wind is coming directly across the beam of the boat. *Rhumb Line: A rhumb line is a steady course or line of bearing that appears as a straight line on a Mercator projection chart.